Cardiff International Comic & Animation Expo was a neat little convention, especially for one so new! I'm so glad I went, despite my nerves and anxieties about the whole thing. The only complaint I have is that the con was separated into two or three rooms, and sadly the room I was placed in was a little out the way and not well signposted. I still turned over a profit on my sales, but it would have been nicer to have had the constant traffic the main room had. I was completely anxious about setting up because my table was surrounded by Proper Comic Creators who actually, y'know, have a comic to sell, as opposed to my table full of prints. I'm glad ugerchucker snapped a few shots of my table, because otherwise I'd not have any of the actual display. Luckily for me, the very first people to walk in happened to be TF2 fans, and there followed a stream of gamers and pony fans who were not only a delight to chat to, but actually bought lots of my prints! One guy actually bought £10 worth of my Personality Core badges! It was awesome! The people there were generally a little older than the MCM crowd, and it was really fun gassing away with guys about old television shows and cartoons we used to watch as kids. There were quite a few cosplayers, including a striking Eleventh Doctor that seriously made me double take and stare at him every time he appeared! He was seriously spot on, it was surreal. The con was held in a hotel that had a spa free of use for those staying, so Saturday night was spent in the sauna, steam room and jacuzzi, before stuffing our faces at a giant buffet restaurant in Cardiff. Sure beats most conventions for an evening's entertainment! I didn't get downstairs much to explore, but from what I saw, it was a packed little con. I'll definitely be heading back next year, hopefully in the main room this time. I didn't take all that many photos due to not leaving the table at all, but here's the few I snapped for those of you with Facebook. 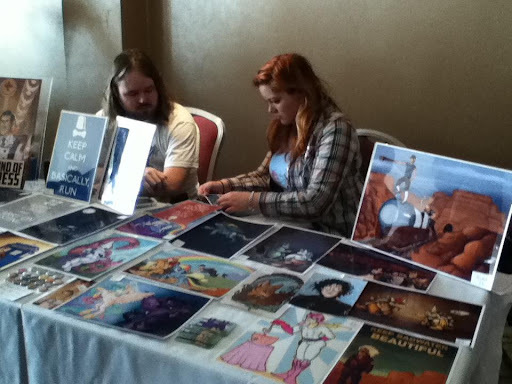 I could make a little collage of the pictures I have of your art tables from expos. I'm pretty sure I have one from your first expo table.